Small business of a young woman. Beautiful young woman worker in a workroom. 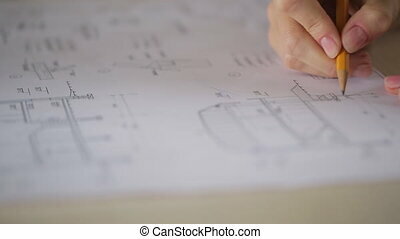 Female carpenter sketching a project. 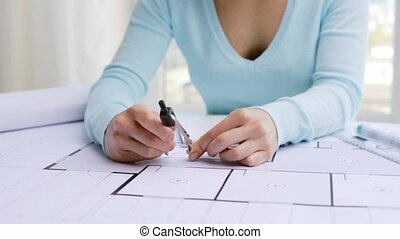 Woman carefully make adjustments on document which lie on table. 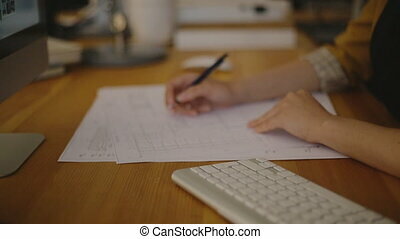 Sheet of paper ,that is on desk in front of her, is full of graphical pictures and notes. 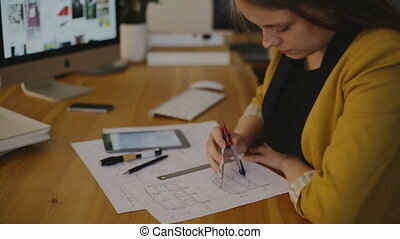 Female uses slate-pencil to add missing elements that are important for further work. 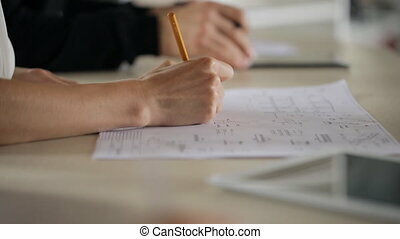 Her elegant hand moves from one point of drawing to another, taking corrects where it is neccessary. White tablet is situated near her. It is useful tool for those who wants to check electronic variant of file and paper one. Two women stand in corridor near windows and discuss plans for today. Executive director, blonde woman who is dressed in black business costume, attentively listens to her secretary. Brunette keeps diary in her hands that she checks from time to time. Female patiently lists all meetings, conferences and others matters that were planned for this day. Her boss is busy with tablet, which she keeps in her arms. 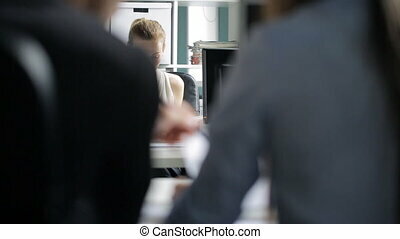 She slides by her finger on glass surface of computer screen, looking through files. Portrait view through co-working people shoulders on boss. 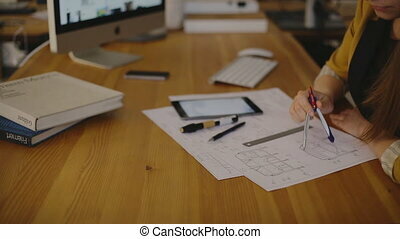 Young business woman is sitting at desk with computer working with tablet pc checking graphic indicators of increasing and decreasing correcting it and comparing printed on papers, documents information with internet data. Female has long blonde hair done in pony-tail wearing classic formal clothes such as sleeveless blouse of white color and subordinates blue shirt and violet jumper. Portrait view through people shoulders on boss workplace. 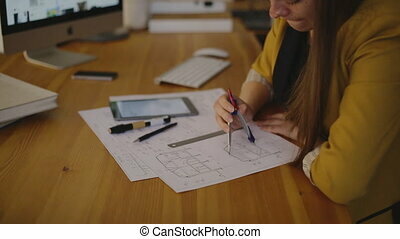 Young business woman is coming to office sitting in chair and starting working with tablet pc. Sitting at desk with computer she is checking graphic indicators of increasing and decreasing comparing printed on papers, documents information with internet data. Female has long blonde hair done in pony-tail wearing classic formal clothes such as sleeveless white blouse and subordinates blue shirt and dark jumper. 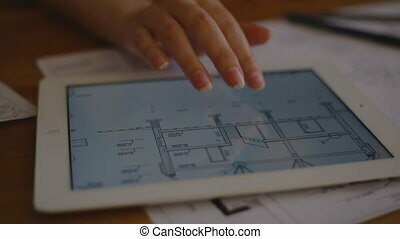 It is close up image of correcting blueprint or plan of building or house. 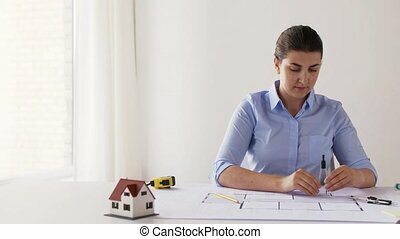 Woman is working out project of construction plan according to appropriate standards and rules using pencil pointing problems, mistakes and making correction in work printed. There is a carton paper with picture of architect or constructer work. 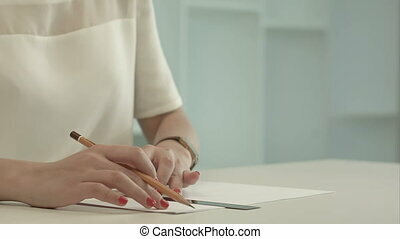 Female is right-handed holding stationery very careful concentrated on her actions with classic accurate manicure and soft hand skin. 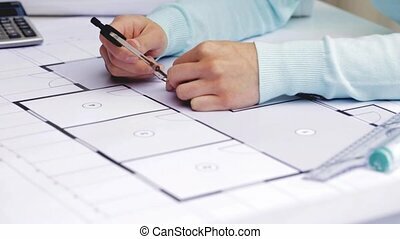 It is close-up image of co-working people correcting blueprints. 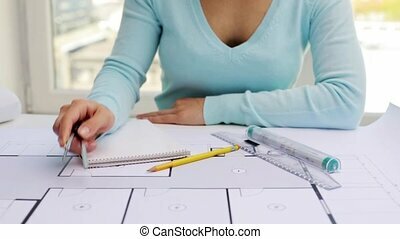 Sitting at desk male and females are working out project of construction plan according to appropriate rules and standards pointing problems, mistakes and making correction in work printed using pencils. There is a carton paper with picture of architect or constructer work. Concentrated man and women are wearing classic elegant clothes of blue, white and dark violet color. 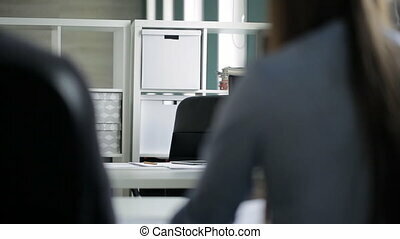 Young female is trying to open clothes bow in office corridor. Squatting she is turning key in vain and spanking before getting bag of dark blue color standing insight shelves with doors of yellow and grey colors locked and numbered. She is wearing blue shirt, brown loose hair and black jeans. There is woman standing on background looking for something in box. She is wearing blonde hair done in pony-tail classic pants and sleeveless white blouse. Two office workers report to their boss results about work done. 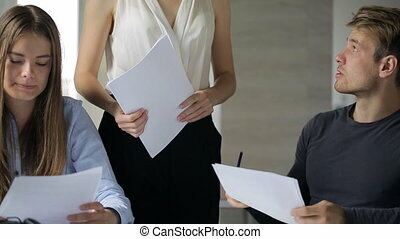 Executive stands near table, where her subordinates sit, and attentively listen to them. Man in black sweater with slightly disheveled hair explains some details of documents to her. He keeps sheets of paper in his hands and check them during their conversation from time to time. Director points to some important parts where he should pay his attention. She is dressed in elegant business suits which perfectly fits to her figure. Three persons stand near bar table and do working affairs. 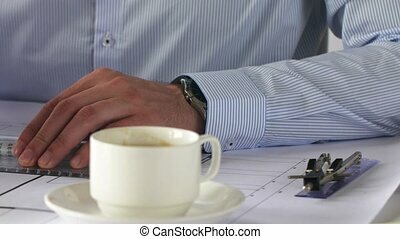 It is more comfortable workplace for those who wants to have rest from atmosphere of overcrowded office. 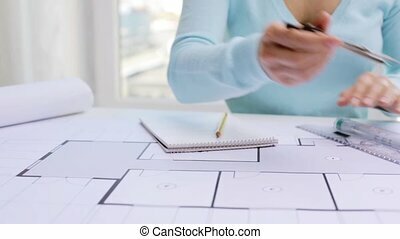 Blonde woman in elegant white blouse is busy with drawings which lie on desk in front of her. 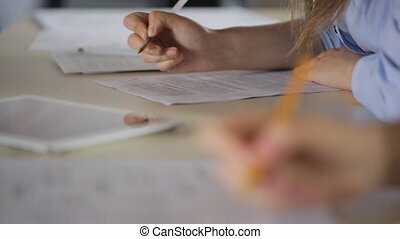 She keeps slate-pencil in her right hand to make adjustments where it is neccessary. Female, who stands near her, talks on cell phone. 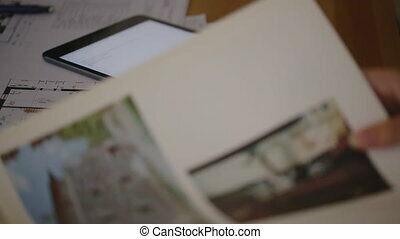 Man cooperates with lots of documents and tablet, which he uses to check some data. 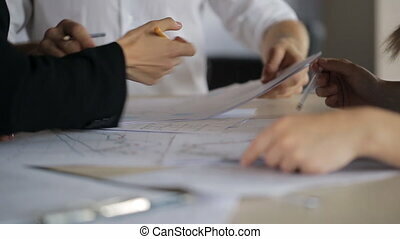 Designers sit at same table and consider building plans on paper at each other. They are working to collect baseline data for designing, solution of technical issues on assigned facilities during entire period of design and construction. They have different professional experience and they sit next to each other that we could ask or suggest a solution on issue. 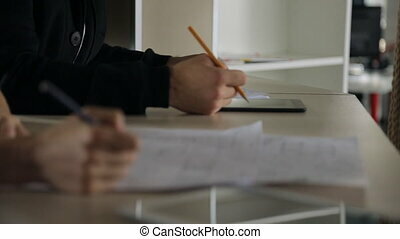 They hold pencils in order to make notes in their schemes. 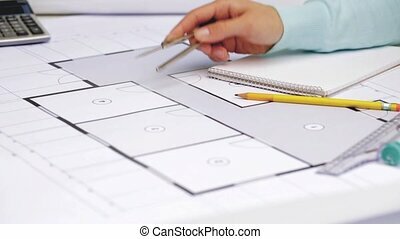 Working with blueprint and text by hand with pen in office of construction company. 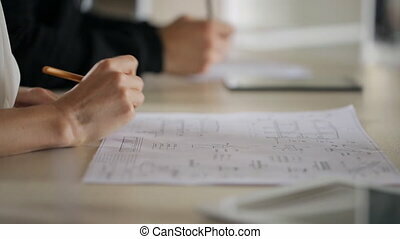 Work is underway on design of utility networks in a country house. 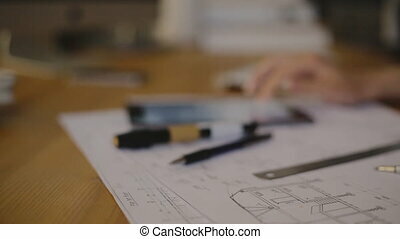 They include work on design of heating system, sanitation and sewerage, water supply, air conditioning and ventilation. 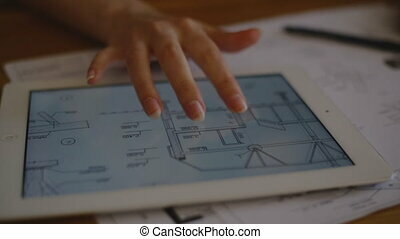 Experts prepare estimate and a detailed plan of installation. It displays details of future ceiling, building walls, laying of pipelines and electricity networks. 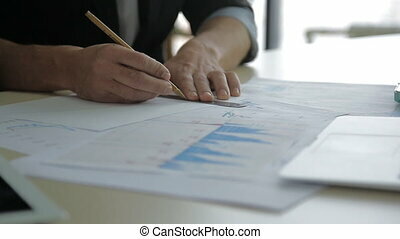 Active discussion of charts and plans on paper with your hands and pencils behind a desk. Their table is littered with graphs with curves and flowing lines of different colors. 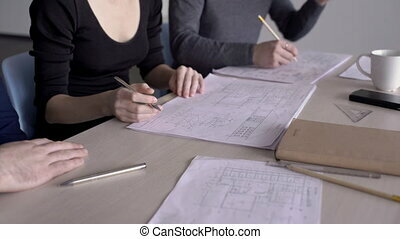 They discuss them, showing each other interesting places them on documents using fingers and pencils. People work by economists in field of statistics and involved in improvement of forms of work organization and management, as well as routine records. One of women is dressed in a black suit with buttons on sleeve. 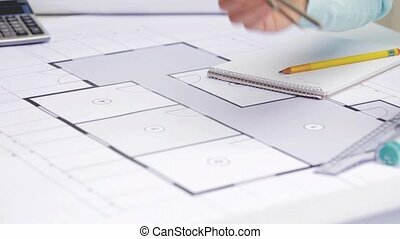 Head of construction project approves work from engineer and architect. 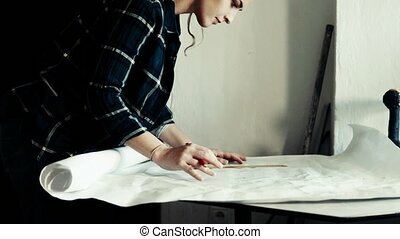 Woman checks document from a group of designers and puts her signature on drawing for further work. 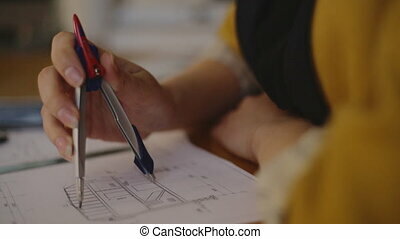 Woman shows man concept on schemes lying on table. 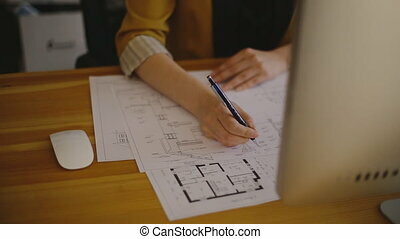 Sheets of paper with painted plans on them are spread on all surface of workspace, there is no free place on it. Male attentively listens to female who explains him idea that he cannot understand without help. She uses pen to show him important parts of drawing. This students in classroom do task for lesson devoted to arhitectural design to practice in drawing complicated outlines to design housing, industrial and public buildings.